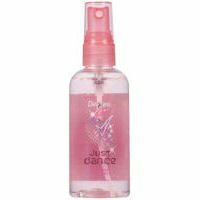 Degree girls body mist, just dance 3 oz. Releases extra protection when you need it most. Anti-Perspirant, Deodorant Unilever Active Ingredients: Aluminum Zirconium Tetrachlorohydrex GLY (17.8%) Apply to underarms only. Inactive Ingredients: Cyclopentasiloxane; Isopropyl Palmitate; Stearyl Alcohol; Mineral Oil; Talc; Hydrogenated Castor Oil; Fragrance (Parfum); Steareth-100; BHT Uses: Reduces underarm wetness. For external use only. Do not use on broken skin. Ask a doctor before use if you have kidney disease. Stop use if rash or irritation occurs. Keep out of reach of children. If swallowed, get medical help or contact a Poison Control Center right away. Degree Girls Body Mist Twilight Kiss 3 oz. Mesmerize your senses with the new hypnotic scent of Twilight Kiss. This long lasting fragrance is touched with light spellbinding feminine florals of magnolia petals and violet, topped with a starry kiss of ripe guave fruit wrapped in a velvety embrace of vanilla and rich sandalwood. Lightly mist over body every day, anytime, anywhere to leave you utterly spellbound and wanting more. Fall in love with our flirtiest fragrance ever! Love's new long-lasting fragrance open's up with a crisp blend of sparkling notes of green apple and juicy mandarin. A combination of delicate gardenia petals and jasmine followed by essences of gentle white woods and smooth vanilla cream. It's made just for you to use every day, anytime, anywhere. Just as sweet as your first kiss! Shake up your senses. Don't wait to be asked, just dance. It's luscious fragrance blend of sweet red berries with a dash of zesty citrus, keeps you cool all over when you wanna cut loose. Use everyday, anytime. With just dance's new long-lasting fragrance you'll never have to leave the dance floor. Compare prices on Degree Girl at ShopPlanetUp.com – use promo codes and coupons for best offers and deals. We work hard to get you amazing deals and collect all available offers online and represent it in one place for the customers. Now our visitors can leverage benefits of big brands and heavy discounts available for that day and for famous brands.